Cynthia Bailey is taking to her Bravo Blog to dish on this week's episode of The Real Housewives of Atlanta. 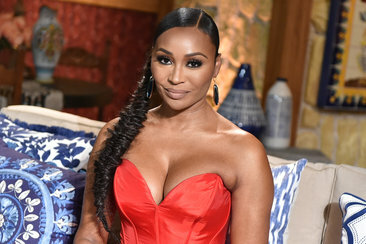 Cynthia Bailey shares her thoughts on everything that went down on Part 1 of the Real Housewives of Atlanta Season 10 reunion. BravoTV.com: What went through your mind when Kenya said she was pregnant? Were you surprised when she said that you can't keep a secret? Cynthia Bailey: I was very excited to hear the news of Kenya being pregnant, and had she confided this news to me before she announced it at the reunion (and asked me to keep it a secret), I ABSOLUTELY would have! Just as I would’ve kept her wedding a secret if she’d told me. Believe me, I can hold water — I can hold an ocean if my friend asks me to! We confide in each other all the time, and there’s never been a situation in our circle where I’ve ever betrayed Kenya’s trust since we’ve become great friends. With that said, I love Kenya, and I will always celebrate her happiness. BravoTV.com: Do you think that NeNe and Shereé can move forward from their issues? CB: I never say never! You have to remember that there were a couple of years that NeNe and I weren’t friends, and I didn’t know if we would ever be friends again. It took some time, but we eventually found our way back to each other because we had a true friendship and a real connection. However, there seems to be a major disconnect between NeNe and Shereé, and I think it’s been that way for most of their relationship. So I’m not sure if you can reconnect with someone that you never has a true connection with to begin with. What do you think about Cynthia’s blog?